You picked the new Monarch Red Label! 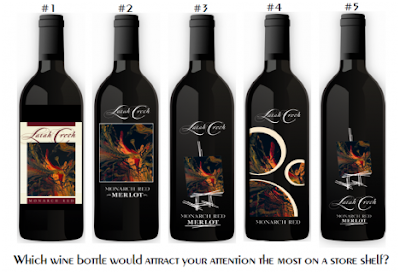 Latah Creek Wine Cellars was asked for your help in choosing a new label for the Monarch Red series. The label features art by Edward W. Gilmore. The Original painting that inspired the label hangs in the tasting room. Artist rendition prints and giclees are available to pair with your wine.The new labels were designed by BHW1, Scott Kneshaw designed the one on the left, which is currently on the delicious Monarch Red. At Latah Creek Winery. Over 500 votes were cast during their 28th Anniversary celebration weekend. After looking at the results, Mike Conway thinks should have had either #3 OR #5 as they were variations of the same theme so both weren't needed. The clear-cut winner though was #2 - very similar to what they did initially but with black background. SIP readers liked those circles more than the people who voted in person at the winery. But #2 edged them out. Shelly from Liberty Lake Cellars had the outstanding idea of using a few of the variations in a series. Want to know my vote? It was #2. I did think the circles were eye catching but it really didn't showcase the art very well. I adore that painting and couldn't get over it being broken up. Latah Creek Winery says thank you so much for your valuable input. I'm looking forward to seeing the Monarch Red Series debut. We already know what Latah Creek Winery puts inside is consistently brilliant. So what are they going to do? I think almost everyone will be happy with the answer. Latah Creek is going to use #2, the top vote overall vote recipient. BUT....I spoke with Mike Conway and he informed me Latah Creek in considering also using the circles (#4) and easel (#3) as the Monarch Red is a series of Winemakers Reds. Shelly from Liberty Lake Wine Cellars was at the winery when I was there and she had the great idea of using more than one. After she left Mike and I agreed that that was an intriguing concept. I'm glad it's an option and don't you think 3 versions of the Monarch look great in one gift box would be stunning? Okay, half of these are gone. the fourth one from the left with the three arches. There is a voting poll widget to the left of this post. Would you mind casting your vote on there for an official count. Hara, that means you can only choose one. Thanks har a and Sun Spangled Gardens your post and for following SIP. The 4th one from the left would stand out the most on a shelf to me. 4th from the left with the 3 curvy things! Done! Did it! Enter me! There is a reason I am know at the Chocolate Lady! I'm signed in, but still not able to vote using poll widget at left. I vote #4. It's showing the votes on when I (the blog author) is signed in. Don't worry. I'll count everybody's comment and/or vote in for an entry for the Tour de Chocolate! Thanks everybody for following Sip. #4 looks too much like a default design from Mac, They all use the circles to highlight different areas. #5 is much more elegant and highlights the art rather than the designs. # 4 is my favorite!